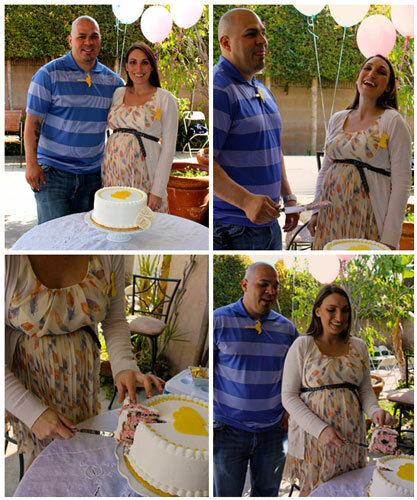 With the pregnancy of their first child, Erin and Michael debated on whether they would find out the gender of the baby or not. When the wait became too much to handle, they decided they wanted to do something special to announce it to their loved ones. 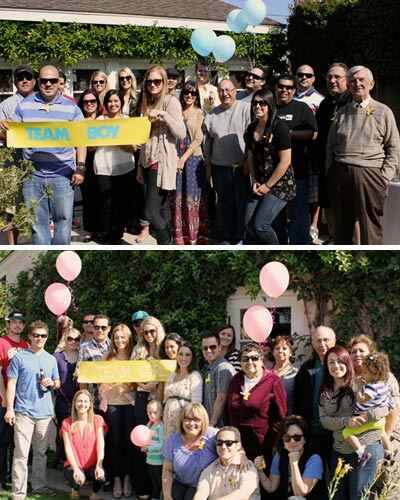 The excited couple decided that the perfect way to find out would be with friends and family at a gender reveal party. 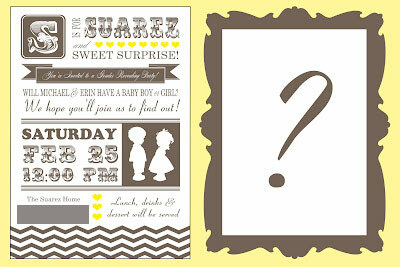 Erin created an adorable invitation with yellow and brown accents. I love the silhouette style boy and girl she used in the invitation and through out the party. There are so many fun diy elements in this party. 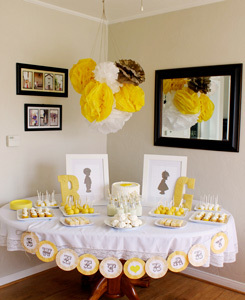 For the dessert table, she suspended brown, yellow and white tissue poms from the ceiling. The same adorable boy and girl silhouettes were framed and displayed. 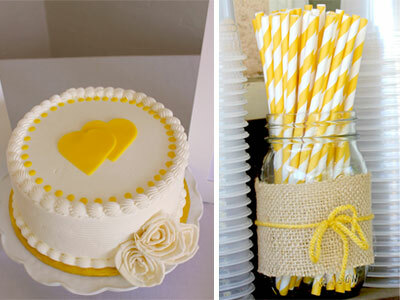 She served cupcakes, lemon bars, meringues, cake pops, marshmallow pops and milk with cute yellow striped straws. 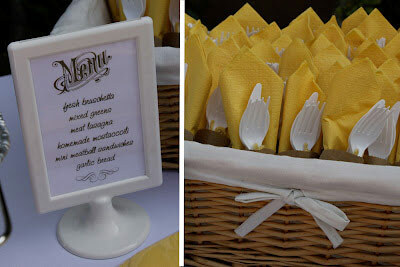 Everything was laid out on a lacy white table cloth. 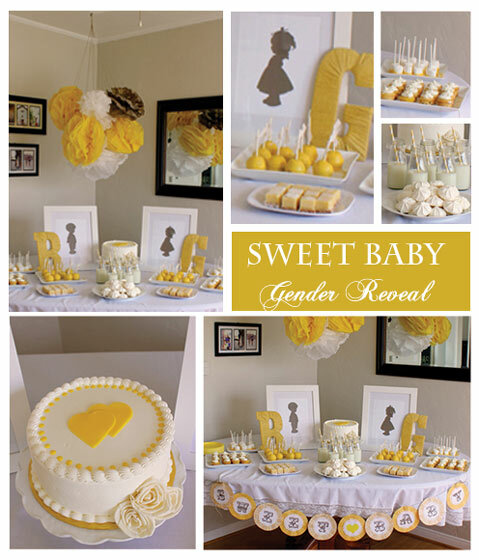 She also pulled in the same yellow hearts and brown lettering from the invitation for a cohesive look. 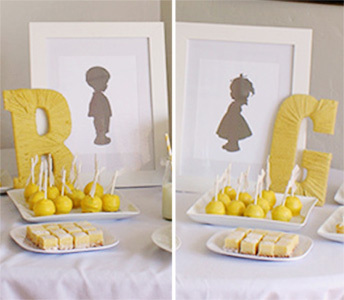 To go with the "boy or girl" theme, she wrapped a B and G letter with yellow yarn for a vintage look. 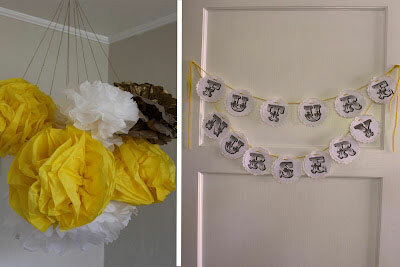 Here is a close up of the adorable poms and a sign she made for the nursery. For the meal, they served fresh bruschetta, mixed greens, meat lasagna, homemade manicotti, mini meatball sandwiches and garlic bread. Yumm! 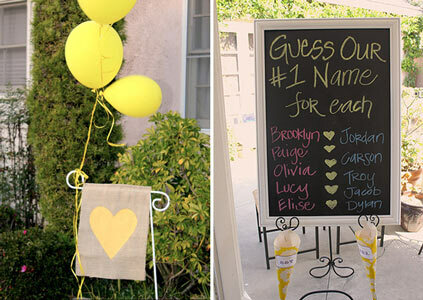 One of the fun activities they had was to have the guests choose the gender they thought the baby was. They had yellow foam mustaches for the boy and yellow foam bows for the girl. 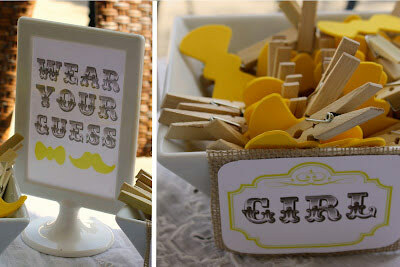 It was connected to clothespins so the guests would be able to wear their guess. 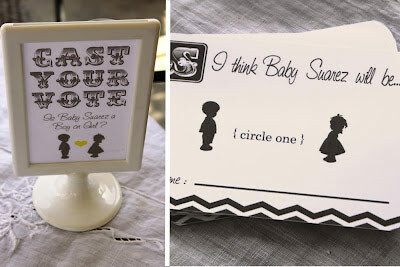 She also made up cute cards for the guests to write their guesses down on. She had an adorable burlap sign made for the front. Another activity they had for their guests were for them to guess the top names they had picked if it were a boy or girl. Here is the cake they used for the gender reveal. And here is the cute couple cutting the cake. I love all the facial expressions! Congrats! It's a girl!! 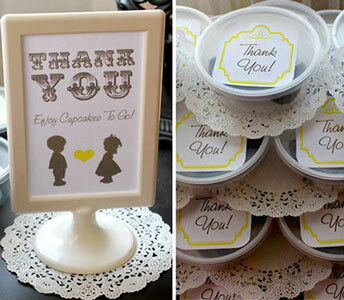 As an adorable favor for the guests, Erin made "cupcakes to go" and stacked the containers with doily layers. What a great way to say thank you! Thanks so much for sharing your party story with us Erin! You did a wonderful job on all the details!